U.S. Public Health Service representative Jason Krumbeck teaches people about balance issues. 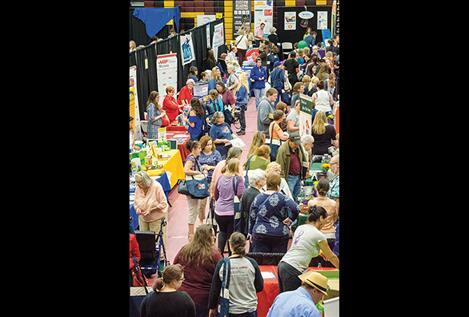 Hundreds of women and some men attend the health fair on Thursday. 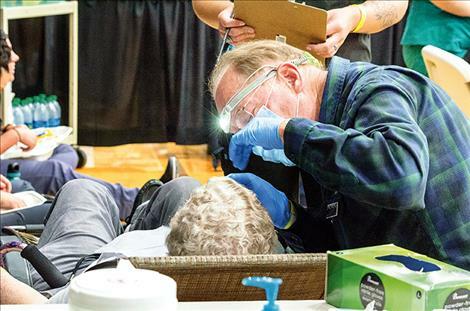 A Salish Kootenai College dentist checks to see if a woman has any dental issues at one of the booths. 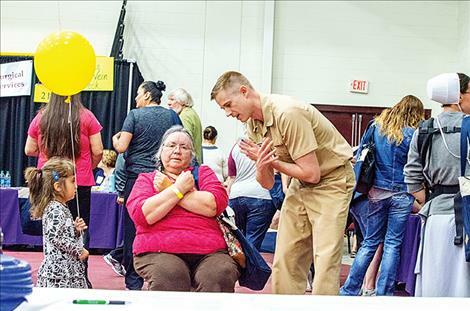 PABLO – Lives were saved again this year during the Women 4 Wellness health fair at the Salish Kootenai College on Thursday, May 24. Eleanor Vizcarra, W4W co-organizer, said every year hundreds of participants receive a number of free health screenings at the event, and some positive test results are found. She said participants often take one of the screenings with no idea that they actually have a problem, but the early diagnosis gives the patient life-saving treatment options. Support is given for those with a positive test. Several screenings were available for skin cancer, breast cancer, varicose veins, cervical issues, cardiovascular function, diabetes, dental exams, blood tests and more. 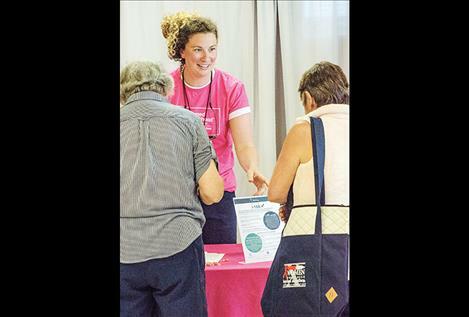 Many healthcare professionals in western Montana participated to provide the screenings and information. “We couldn’t do this without their support,” Vizcarra said. Preventative care and testing is something people are often not able to do because of the high cost of insurance deductibles and others don’t have insurance, she said. 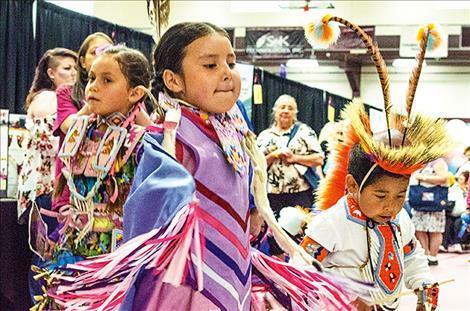 The SKC Center for Prevention and Wellness developed the event to help make preventative testing possible for all people on the Flathead Indian Reservation. Donations and sponsors help fund the event. More than 50 volunteers organized the event with medical assistance provided by SKC and Job Corps students. “I want to thank all of the healthcare providers, volunteers and sponsors who helped make this happen,” Vizcarra said. Participant Kathe Randle said she was one of the fortunate people with insurance at the event, but she didn’t want to go to the doctor for a little vein on her eye. She said she was able to have it looked at and told whether she should see a doctor. She said many people attend the event every year and get the same tests so that they can track their progress to see if anything is changing. 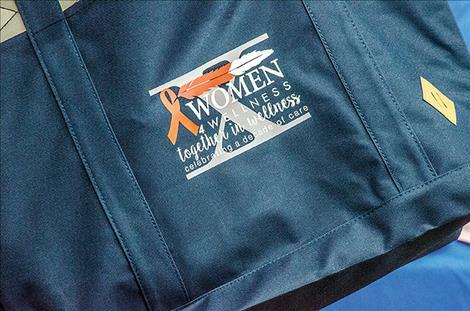 Participants were given a tote bag to collect the many items given out at the event from businesses, agencies and individuals including makeup, pens, and coffee mugs. This year, 150 men participated in the event. 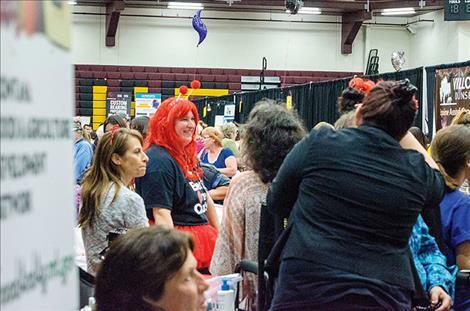 Though W4W started out as a health fair for women, and the majority of participants are still women, men are also welcome. Co-coordinator Niki Graham said the event is also about giving back to the community. Donations for women in need and canned food donations for local food pantries are collected at the event. Safe Harbor of Lake County was one of the event’s many vendors. W4W supports the crisis intervention program with donations of items women and children might need as they seek relief from domestic violence, sexual assault or stalking. Every year, they bring out the laundry baskets and collect more items. At one station, the American Indian Alaskan Native Clinical Translation Research Program was collecting information for a community-based study to identify problems associated with diabetes including taking medication, food choices and exercise. The Confederated Salish and Kootenai Tribes and the Montana State University are working together on the project to create an app to help people with the issues identified in the study. The Boys and Girls Club of Lake County and the Flathead Reservation set up a booth with information about their program. Representatives also let people know that cherry orders are being taken for this year’s fundraising event. People can call the club to pre-order cherries. The U.S. Public Health Service representative Jason Krumbeck was at the event testing people’s balance and letting them know that falls are a big issue. “They cost more and cause more hospitalizations every year than car accidents,” he said. Planned Parenthood was also at the event to tell people that free or low cost health services are offered at one of their many offices including the one in Missoula. The program offers cancer screenings, sexually transmitted disease testing, treatment options, and birth control.